An Education Secretary to Dismantle Public Education? Kumashiro is dean of the University of San Francisco School of Education and author of Bad Teacher! How Blaming Teachers Distorts the Bigger Picture. 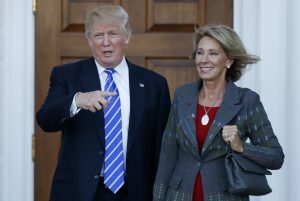 He said today: “DeVos has not taught or worked in public schools, or been a parent of public-school children, or earned experience or expertise as a leader, scholar, or teacher educator in public school districts. Nor was she a supporter of candidate Trump. But to advance Trump’s call to deregulate and privatize, she would be ideal. “Through her family foundation (funded by the Amway fortune), and through her personal role on boards for such advocacy organizations as Jeb Bush’s Foundation for Excellence in Education, she has effectively leveraged her wealth to shape policy, including the expansion of school-choice and voucher programs, alongside the deregulation of charter schools, and even the expansion of the Common Core State Standards, which has been derided by Trump but which has figured centrally in the proliferation of high-stakes testing and privatization of testing. These so-called ‘reforms’ have been variously embraced and rejected by members of both major political parties, and yet, the research is clear: none of these ‘reforms’ will strengthen public education overall, and instead, have already proven to indirectly or even directly exacerbate inequities.